The Congress-Hotel Don-Plaza is located in the centre of Rostov-on-Don. It is not only a hotel, but also a business centre featuring flexible conference halls, exhibition areas, and negotiations rooms. The Congress-Hotel Don-Plaza offers accommodation in 233 rooms designed by the best Russian interior decorators. The hotel windows give panoramic view over the Don river and the historical centre of the city. The hotel offers rooms for disabled guests. In-room amenities include: air-conditioning, a minibar, a TV-set, a telephone, a refrigerator, and a hair-dryer. Different room options are available: Comfort Single, Business Double, Exclusive Twin and Double, De Luxe Classic and Studio, Apartments, and Presidential Suite. The Congress-Hotel Don-Plaza offers a selection of dining opportunities. The Aztek restaurant serves exquisite international cuisine with meat, original dressings and spices; Mein Herz restaurant offers European dishes; the Amadeus lobby bar serves an extensive list of desserts. The Golden Hall, located on the 2nd floor, is the largest banquet hall of the city, which may be used not only for recreation, but also for conducting business meetings and negotiations. The Don-Plaza provides catering service as well. The congress centre the Don-Plaza Hotel is well-equipped for hosting different business and social gatherings. It offers 9 conference halls for conducting any events: from public meetings to private talks. The halls can accommodate from 8 to 500 participants. The following equipment is available: sound and light systems, presentation equipment, Internet access, video and on-line conference equipment, leased telephone lines, and other. 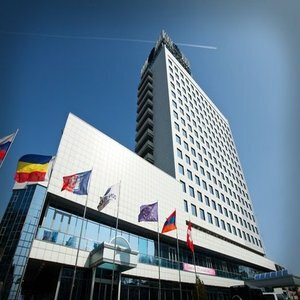 The 24-hour business centre offers up-to-date facilities and services: a telephone, a fax, a copying machine, Internet access, car rent, air and railway tickets booking, secretarial and translational services, correspondence and cargo delivery, rent of PC and mini-offices, courier service. The hotel's fitness studio offers a range of SPA treatments, a gym, a Turkish sauna (Hamam), a solarium, and massage service. The Lavanda beauty parlour, located on the first floor, offers all types of hairdresser's services, manicure, pedicure, cosmetology, and professional consultations. Other facilities and features of the Congress-Hotel Don-Plaza include: 24-hour information service, a guarded parking lot, transport service, ATM, currency exchange, laundry, ironing and clothes repair services, 24-hour room-service, concierge service, and floristics.